Generally speaking, whenever people write about ways to improve the performance or productivity of your computer, the tips given are about tweaking this or installing that. Today, we’re going to look at the latter, as far as they help the user experience. 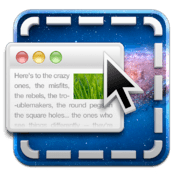 Ever since I switched to Mac a few years ago, there was one feature that Windows had, which I felt was missing from the mac experience: ‘Splitscreen’. In Vista, Win7 and (I hope) Win8, the split screen feature allows you to drag two windows to the opposite upper corners and have them automagically resize, nicely split down the middle. Unfortunately, this feature is problematic when using dual screens, but still remains helpful. The lack of this amazingly useful feature in Mac, may’ve been one of the first issues I sought out to maintain my need for screen orderliness. While there are a couple apps out there that address this problem, the only one I have really used long-term is called Cinch. Cinch provides you simple window management via dragging to hot corners. When each window is dragged to its respective corner, they are resized to exactly half the screen. Where this is highly useful: Copying and Pasting text from one window to another. I use Cinch the most when I’m working with two separate documents. More often than not, this feature has enabled me to keep an constant reviewing eye on source material when composing a new document. Whether it be taking rough notes and fixing them up for a final product or writing a new cover letter/pitch/news release; this app has reduced my headaches by… half. Whereas Cinch is actively useful, smcFanControl is passively useful – if that makes any sense. Back in my PC building days, I put together a few monsters with a crazy amount of air cooling. When I first started, manual fan control was not entirely possible. Eventually, Zalman, Thermaltake et al., released controllers that you could mount in a 5.25 slots, which gave you the ability to adjust fan speeds. The controller I had gave me control over four of the eight fans I typically had in my case, allowing me to crank up the fan speeds for gaming sessions, which in turn made the computer sound like a small jet at the opposite end of a runway. Prior to acquiring my current MBP, I had purchased a cooling pad. However, with this newer MBP, I have found the pad unable to keep up at times with my cooling needs. That’s where smcFanControl came to the rescue. Where this is highly useful: when working in photoshop/lightroom or running chrome and firefox, you can actively boost the fan speed before temps get out of control. 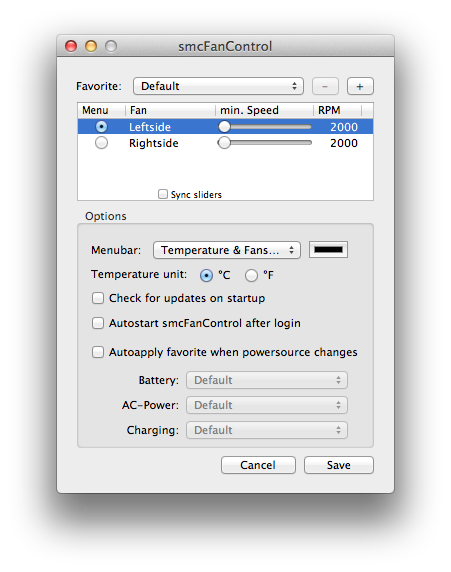 As you can see to the right, smcFanControl gives you control over the two fans in your MBP. This is key as power is handled on the left side of the computer. Editing text can be a real hassle. 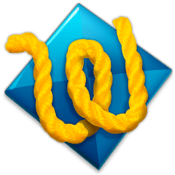 Thankfully, there’s no shortage of text editors out there – despite text editing becoming a lost art. To say that TextWrangler is a “feature-rich” would be putting it mildly. Truth is, this program has features in it that I cannot begin to fathom where they would be needed. I can only assume that they are things that developers and programmers would use. I find TextWrangler to be extremely helpful in three ways. 3) Fast and dirty HTML editing. Whereas, Cinch controls windows, smcFanControl adjusts your fans and TextWrangler wrangles text… Well, It’s like this program was made in Soviet Russia. Yep. I’m going there. IN SOVIET RUSSIA, APPLICATION CONTROLS YOU. Let’s face facts… we live in a society of constant distraction. One of the biggest perpetrators of causing distraction is the internet, but more specifically, social media sites. Selfcontrol makes it possible to maintain productivity in an attention-demanding society. Through its extremely straight-forward interface, you are given the ability to impose blocks on certain websites, preventing you from wasting your time finding out what idiotic links/thoughts/pictures/location-check-ins your friends decided to share. What I love most about selfcontrol is its logo. It’s an Ace with a skull and crossbones in it. A quick analysis of this logo makes it painfully obvious as to the reason for its creation. It gets you the F off acebook. Of course, that could just be me reading a little too much into things and making a connection that’s not actually there. Nevertheless, it does allow you to control your need to facebook all hours of the day, reducing your time spent to a fraction. And it does this for other websites too. Whatever website you deem distracting, you can add to the blacklist. If you’re thinking this will stop you from only using facebook in your browser and allow you to use Tweetdeck or Hootsuite, you’re wrong. It shuts down access completely. Everything you add to the blacklist, will be blocked for the set time amount. There is no way to control websites individually. If you open this app, set your time and then quit the app, IT STILL RUNS IN THE BACKGROUND and will stop you from accessing those sites until the timer expires. Your mac’s screen has one thing in common with the sun: Kelvin White Balance. What the hell does that mean? It means, that it is optimized for a colour temperature of 5200k which is approximately the same as bright, full sunlight. This is a problem for those of you who find themselves at computer for more than 8-12 hours a day. As scientiests and psychologists have discovered, light radiation does some really screwy things with our heads. F.lux adjusts the colour temp of your screen to more sensory-friendly levels throughout the day, so that you are not exposed to a constant blasting of 5200k all day. Instead, as the sun goes down, it adjusts, moving toward the candlelight-like levels of 3200k, which saves your eyes and brain quite a bit. By sliding towards the warmer tones of the light spectrum, it reduces the strain put on our eyes quite significantly. Without going too much into detail and science: your brain produces a chemical called melatonin, which allows you to sleep. It only produces this chemical as light levels decrease. With reduced exposure to sunlight, your brain starts to go into sleepy mode. Unfortunately, because our days are not in sync with the sun anymore, we don’t allow our brains to produce melatonin properly, consistently anymore – or at least, not in the volumes we actually need. So, F.lux not only makes your screen easier on your eyes by muting the tones, it also makes your screen easier on your brain. Now… I did have an honourable mention that I was going to tell you about, but after discovering that the program is limited to older non ipod devices, I felt it was not worth mentioning and thus, was deleted. Because of this fact, I am relegated to finding an alternative worth talking about, but will not do so until I find a worthy successor. The program in question is called xPort and it allows you to take music off older iPod devices and put it on whichever Mac you have the program installed on. If you have an old iPod that contains music you have since deleted from your Mac, by all means, try xPort – but remember, it ONLY works with non-iOS devices. This entry was posted in Mobile, Music, tech, Tech skills, Technology and tagged adjust, apple, applications, cinch, color theory, communications, control, f.lux, iphone, mac, macbook, macbook pro, macbookpro, programs, science, selfcontrol, smcFanControl, social media, tech, techno, technology, textwrangler, twitter, xport. Bookmark the permalink.